He appeared in the classroom one day. She knew him better than anyone…that much was obvious. The history was unclear to me. But his gentle nature was apparent… I did not recognize him from the photo on the wall. The photo showed a chubby kid, heart shaped sunglasses masking his eyes. He seemed to be a typical high school football player. Black and proud. The boy who was in front of me was gaunt, thin… His eyes were huge, clear and luminous. Did he wear glasses? I can’t remember. I remember the hat though. It reminded me of “Fat Albert” and the kid with the stocking cap. He was funny…always a smile on his face. I didn’t know his story. She told me that he had cancer. That was all she said. Over the weeks the story became more clear. She has known him for several years now. The one that she had “gotten too close too.” I could relate because that had already happened to me with another. I had realized quickly it could be the danger of the job. The desire to take them all under your wing, and make their childhood’s happy and glad for life. She said he was her “9th child”. At first there was hope… but the tumor had spread. I came in one day and he had figured out that I painted. He was excited because he had always had this idea that he felt he couldn’t put down on paper because “he was not a painter”. I tried to encourage him that if he had the idea he could probably produce it in some way shape or form. But it struck me from the get go because the first thing he mentioned was the title. He wanted to call it “The girl who was not there…”. It hit the poetry chord in my being. He went on to describe it quite clearly. 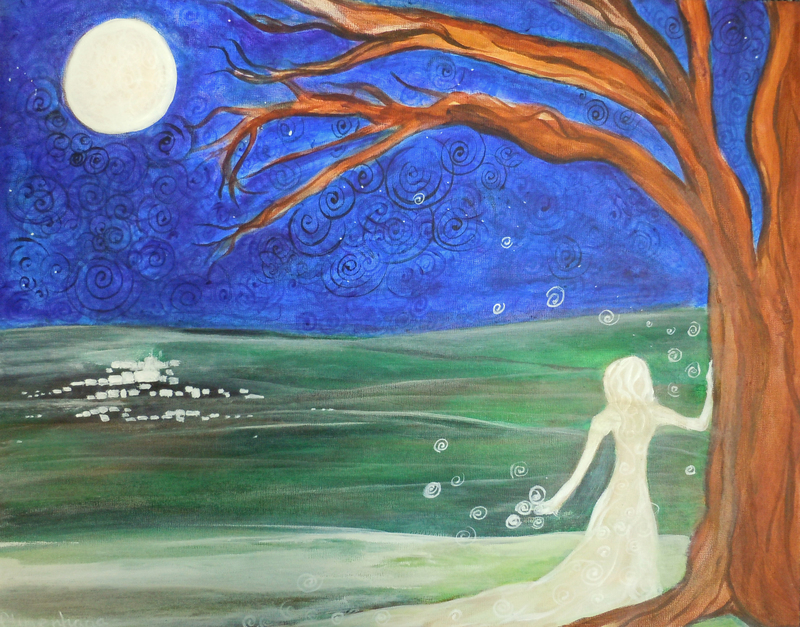 A girl standing next to a tree…ghost like…looking over the land at the town below…night time…blue/black….stars in the sky…spirit bubbles surrounding her floating out into the ether…the moon is full and shining…. I finished it, but reluctantly took it to her. In a short amount of time, I found I did not want to let go either. I had not been given enough time to get to know this boy. He had more to tell me. She told me she would leave it at school until he came back to town and then she would give it to him… He had gone to the city for a check up because things weren’t going well. I think I knew before her that he wasn’t coming back. I didn’t want to tell her that though. Yesterday she told me she was taking the painting with her to show him on Sunday. Selfishly, I hope he sees it.